Chelsea Green Publishing Company, 9781603582001, 190pp. The Transition Timeline lightens the fear of our uncertain future, providing a map of what we are facing and the different pathways available to us. It describes four possible scenarios for the UK and world over the next twenty years, ranging from Denial, in which we reap the consequences of failing to acknowledge and respond to our environmental challenges, to the Transition Vision, in which we shift our cultural assumptions to fit our circumstances and move into a more fulfilling, lower energy world. 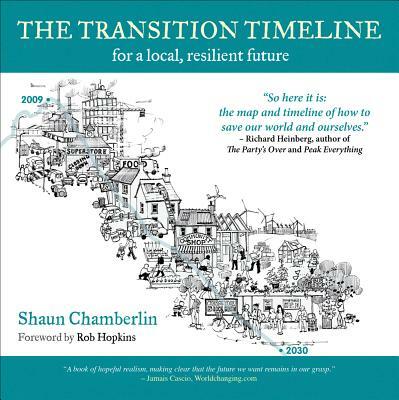 The practical, realistic details of this Transition Vision are examined in depth, covering key areas such as food, energy, demographics, transport and healthcare, and they provide a sense of context for communities working towards a thriving future. The book also provides a detailed and accessible update on climate change and peak oil and the interactions between them, including their impacts in the UK, present and future.Use it. Choose your path, and then make that future real with your actions, individually and with your community. As Rob Hopkins outlines in his foreword, there is a rapidly spreading movement addressing these challenges, and it needs you. Shaun Chamberlin is the founder of http: //www.darkoptimism.org and has been involved with the Transition Network since its inception. He is also the TEQs Development Director at The Lean Economy Connection and a member of the Department of Energy and Climate Change's Personal Carbon Allowances Advisory Group, as well as a core member of Transition Town Kingston, UK.